Dia dhaoibh agus fáilte ar ais roimh gach duine. Tá súil againn go mbeidh bliain den scoth agaibhse go léir agus go mbainfidh sibh taitneamh agus tairbhe as an scoil bhliain atá romhainn. Go n-éirí an t-ádh libh! 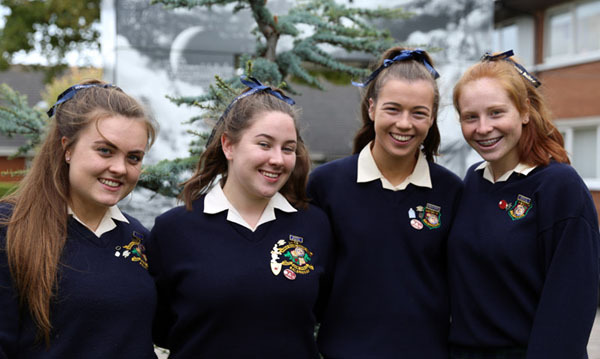 We would like to give a big welcome back to all students and staff here at Loreto Balbriggan as we embark on a new school year filled with friendship and new opportunities. We hope you all had a lovely summer break. To the 1st years, we hope your transition from primary to secondary school has been exciting and rewarding, we hope that you now feel apart of our vibrant and diverse loreto community. To the 6th years, our friends, it’s the beginning of the end. We have had a beautiful journey here filled with friendship and laughter. There is no doubt that challenges are awaiting us in the year ahead but if we stick together we will get through it all. As Helen Keller says, “Alone we can do so little; together we can do so much”We would like to give a special thank you to our wonderful year head, who has helped us grow into the young adults we are today and who is embarking on a new chapter in her life. And finally, we would like to wish everyone the very best of luck for the year ahead, especially to all our new staff and students, whom we hope will feel at home here with us.